The Gift Insider would love to hear from you. I’m dedicated to helping you find the very best gifts for everyone in your life, even you! So, if you have any questions at all – questions about the site, questions about specific gifts, or suggestions for gifts you think I should feature– just fill out the form and I’ll get right back to you. In addition, I love spreading my gift-giving knowledge, so I am available for interviews, media appearances and spokesperson opportunities. 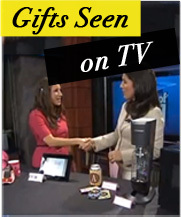 Please contact Lindsay directly by e-mailing lindsay@thegiftinsider.com.